The new Belle River project by Samsung will cost about $700 million, and is an example of the damage brought by the Green Energy Act. Ford ran on repealing the GEA and the end of this appalling legislation cannot come soon enough. The GEA led to the gas plants scandal, because the Liberals had to frantically build new natural gas plants to back up the unreliable power they were getting from wind and solar energy, then scrapped the gas plants planned for Oakville and Mississauga to save Liberal seats in the 2011 election. As PC Infrastructure Minister Monte McNaughton said Thursday, the GEA took away the planning rights of municipalities, which will now be restored, leaving them without any say in the location of green energy infrastructure. That deprived Ontarians of natural justice, turning neighbour against neighbour as developers quietly signed deals to lease privately-owned lands in rural communities for massive wind turbines and solar farms, with the projects then sprung on those communities as a fait accompli, in which they had no meaningful say. NDP Leader Andrea Horwath, still ranting about Ford cutting the size of Toronto council in half, voted with the Liberals to pass the GEA, a far more sweeping attack on municipal governments. Documents released under the Freedom of Information Act, reported by the CBC, revealed the Liberals ignored warnings from their own environment ministry that the province needed stricter noise limits on turbines, had no reliable way to monitor or enforce them, and that computer models for determining residential setbacks were flawed. McCarter warned the GEA had, “created a new process to expedite the development of renewable energy by providing the Minister (of Energy) with the authority to supersede many of the government’s usual planning and regulatory processes … As a result no comprehensive business-case evaluation was done to objectively evaluate” its financial impacts. We need more Conservative action in this whole country. I agree, Jordy. And McGuinty/Wynne got away scot-free! Is it too late to hold them accountable? Thank-you Lorrie, your posting accurately descibes the ridiculous situations we all have been dealing with and trying to understand how to deal with. The deplorable McGuinty/Wynne Green Energy Act has brought Ontario to the verge of BANKRUPTCY. How do we move forward from here without causing more grief for the ratepayers? The Ontario electrical grid demand numbers are available for August 2018, one of the hottest on record. Solar actually kicked in at 14% of demand and during the hottest calm and sunny days when peak backup was needed. As the sun came up the solar farms put out. Very reliable and easy to distribute. IWT’S completely different. 6% overall 2700+ windmills and most of the unpredictable output was during the midnight to daylight hours and had to be dumped as surplus at ratepayers expense. Even doubling the number of IWT’S will not change that percentage much because as the operational parameters have shown us when some are at full output in one part of the province others sit idle or are taking power from the grid which lowers their overall efficiency causing their average to remain about the same. Another battle won but the war continues! Not only that but the Liberal government refused to measure infrasound radiation. They ignored the information available from people like Dr. Mariana Alves-Pereira and Dr. Sarah Laurie at the Waubra Foundation, regarding harm from infrasound radiation and low frequency noise fluctuations. To this day, people in communities where these turbines are running are being harmed. The harm is cumulative. In many cases people are still unaware of this harm because no one, not even the Minister of Health and Health Units have been willing to address the harm from infrasound radiation and LFN fluctuations. Where is the medical establishment? Rural people have been forsaken. This is an ethical crisis. These turbines need to be turned off. Everyone needs to see this presentation given by Dr. Mariana Alves-Pereira in Slovenia in May, 2018. Why is this information being ignored? Even leaseholders and their families are being harmed! We choose the food we eat. We choose to exercise adequately each day… or not. We choose whether or not to get adequate sunlight. We choose the amount of water we drink on a daily basis. We can even choose the kind of water we drink. We choose how we will dress ourselves to protect ourselves from the elements. We choose whether or not to smoke cigarettes or drink alcohol to excess. We choose whether or not to partake in potentially harmful recreational activities. We choose whether or not to get adequate sleep on a daily basis. 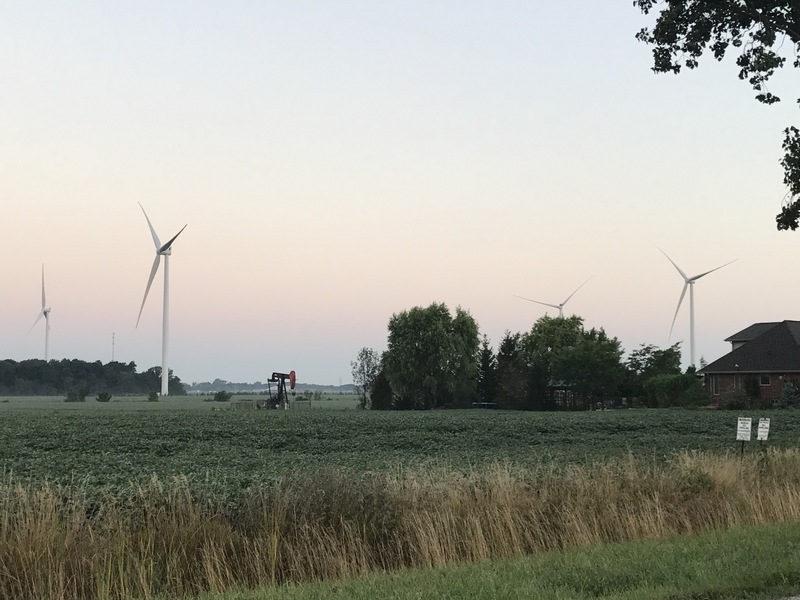 And yet in Ontario, residents of rural communities have not been given a choice as to whether or not they will be exposed to distressing noise and harmful inaudible noise from turbines that have been placed too close to their homes. In a province that promotes a pro- health approach, this situation for innocent men, women and children, who did not consent to being exposed to harm from these turbines in their own homes, is absolutely unacceptable. If it can be rationalized why contracts should be cancelled, it must be demanded that the harm must stop now. Why would there be tolerance for a genocidal ideology toward rural residents? The most costly consumer fraud in the history of the Ontario government. Justified by systematic, cynical lies. Lies very similar to those I endured during my not so happy youth under the communist dictatorship: dogmatic rigidity, intolerance to different opinions and wishful thinking instead of engineering facts. I was sending to Ms. Wynne and her energy ministers my engineering reports very often, even almost desperately appealing to their common sense:” Look– the fully useful wind blows only about 400 hours per year- and the year has 8760 hours.” Never received a reply. Even as I mentioned to them that I am a professional electrical power engineer. The bribes must have been very impressive. Thank you for some realistic critical thinking, Mr. Ford! re the gas plant scandle…. Wow, that was a week for the record books! About now, one week ago, September 21st 2018 most of the workers at the Merivale Transformer Station were on their way home. The portable lunch trailer my crew call home was packed with tools and clothes and various office equipment to stay dry in case it rained over the weekend. It rained,,,,,,the wind blew,,,,,,everything went away,,,,,,everything! The entire Merivale station had been damaged and power was quickly rerouted through the Hawthorne Transformer Station where I will be posted again next week. So what has that got to do with Industrial Wind Turbines, “LOTS”. If the wind is too low they cut out, if the wind is to high they cut out. Every time we need them the most they don’t work and when we do need them the most they seem to only cause grief being so unpredictable. As everyone has witnessed we have lots of power without IWT’S and we could save the cost of paying others to take that power simply by letting the Ontario customers burn it off here. Maybe pay the Ontario customers to use it or give rebates for the more we use. Dumping the IWT power or paying someone outside the province to take it has got to stop! Call your MP, call your MPP, get involved with your municipal council find out who is passing the money out the back door. I would love to have me some of that cheaper hydro!!! Maybe if i relocate my business to NY or Michigan or Minnesota or Pennsylvania i could!! !